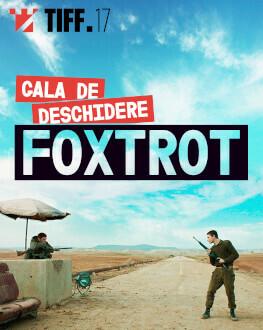 A highly disputed, still brave story inspired by the Israeli – Palestinian conflict, Foxtrot won the Grand Jury Prize Silver Lion of Venice International Film Festival and Ophir Award for Best Film. The movie was inspired by a personal experience lived by the director Samuel Maoz and tells the story of a family torn apart by the tragic disappearance of their soldier son while serving in the army. The courage to approach such a sensitive topic left the director and the movie subjects of strong opposition from Israeli officials whose pressure convinced the American Academy to not include Foxtrot in the shortlist for Best Foreign Movie. Still, critics were not impressed and named the movie one of the best film made in 2017. A reason good enough to be there for the movie premiere in Romania and meet Samuel Maoz and part of its team. This is just one of the surprises that organizers prepared for Opening Gala, more to be announce soon.